Actually, if a weak Darkseid defeated Zeus- then Superman should have an easier time defeating Zeus; since he has defeated the older version of Darkseid one on one- just do the Mathematical computation. Thus, Superman's power should be above most, if not all, Sky- Lords. Superman only beat Darkseid after he was hit by his own omega beams. This Darkseid has defeated Superman twice and killed dozens of Supermen across multiverse. This makes perfect sense when it comes to the Laws of BS Physics that has governed the DC Universe for the longest time. Maybe, Zeus should've call Batman before the match, and ask him to trip Darkseid down some stairs. This might have given Zeus the win for sure. They are no more BS than marvel universe. Darkseid has straight up no sold Supergirl while weakened. Thor has defeated Odin straight up as Orlog and the fights between Thor and Odin are a lot more close than Masterson's failure against Heimdall. Suffice to say he looks no more powerful than Darkseid does in most of his fights with Thor. A future Thanos who got "stronger" kills LT, Galactus, Love/Hate, Infinity, a Watcher and Black Bolt kills the celestials with one shout. 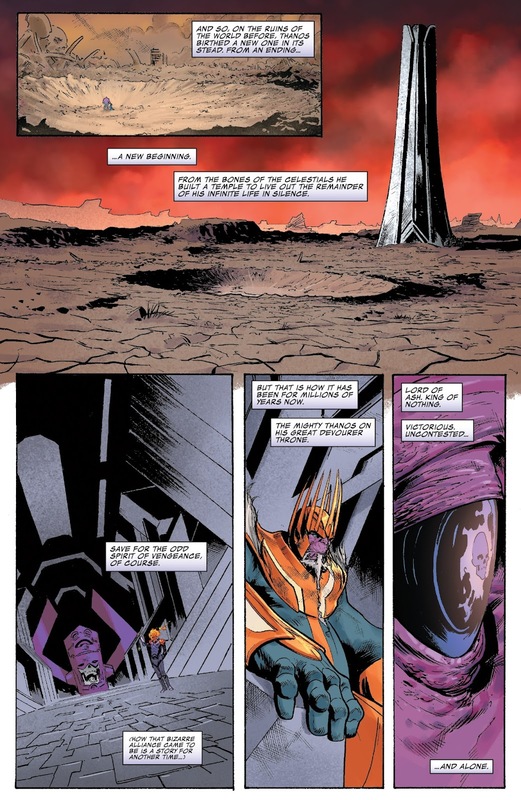 I guess killing Living Tribunal is no big deal and same as Black Bolt killing celestials. With the things he's done and the powers he's taken, we don't know what level of power Darkseid is at now. Orlog did not know how to properly utilize the Odin Force. 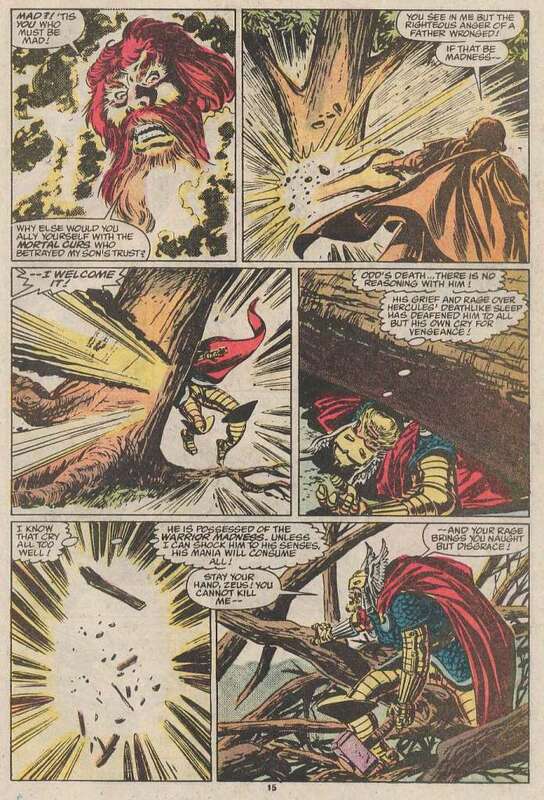 His mind created limitations allowing Thor to hang on. If you recall, the Odin Force itself explicitely showed this fact to King Thor. As for the example you showed regarding Thor vs Odin (the invasion by Odin and Zeus of the Eternal City) Odin was clearly distraught about facing Thor- because he didn't want to be forced to kill him as he did once; plus, you know that as he easily removed all living things from Earth but with a gesture, he could've taken Thor's hammer from him, and turn him mortal. In addition, the Embodiment the Odin Force in that Space Saga was just a portion that couldn't stand up to a much greater portion of the Odin Force that resided inside Volstagg. All in all, you can't possibly compared a son vs a father to Darkseid vs Zeus going all out to destroy each other. Eh, what? He said his end goal is too great to risk. That's quintessential Kirby Darkseid who used combat as a last resort. The guy did not even fight Forever People due to the same reasons. You're just salty at this point. Orlog did not know how to properly utilize the Odin Force. His mind created limitations allowing Thor to hang on. That was never stated or implied. If you recall, the Odin Force itself explicitely showed this fact to King Thor. That's because Thor didn't want to replace Odin. Orlog was Odin in disguise. As for the example you showed regarding Thor vs Odin (the invasion by Odin and Zeus of the Eternal City) Odin was clearly distraught about facing Thor- because he didn't want to be forced to kill him as he did once; plus, you know that as he easily removed all living things from Earth but with a gesture, he could've taken Thor's hammer from him, and turn him mortal. That's nothing about a fight. Darkseid has easily incapacitated Superman and Infinity Man together before too. In addition, the Embodiment the Odin Force in that Space Saga was just a portion that couldn't stand up to a much greater portion of the Odin Force that resided inside Volstagg. All in all, you can't possibly compared a son vs a father to Darkseid vs Zeus going all out to destroy each other. It's not a portion of the power. It was the whole Odinforce and has been shown again. He was about to "waste" his time fighting Wonder Woman, who by the way was sure she would win this time. Diana is the embodiment of truth telling so Darkseid couldn't be that far out of her league for her to be so sure. Anyway, Darkseid most certainly was talking about a risk of losing. Darkseid: You've never been able to defeat me before. Wonder Woman: Then this will be a first time. The Justice League shows up. 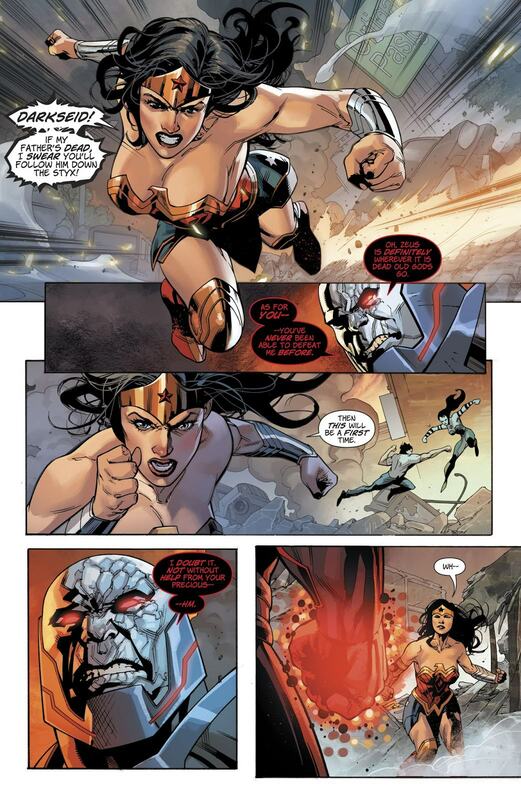 Darkseid's dialogue clearly meant to indicate that Wonder Woman could not beat him without help from her "precious" Justice League. Obviously that meant with the League, she could defeat him. Then Darkseid states, "I'd delight in testing out my newly regained power, too, but my end goal is too great to risk now." The clear context is that the risk lies in testing himself against the League. So we have a rough measure of current Darkseid' power level, it's roughly equal to 6 members of the Justice League. Well, at least until he gets beaten by Superman alone again. That explanation makes no sense as to why Darkseid fled. Zeus flat out says to She Hulk that she has made error of his life and wouldn't calm down till the next page where he sees Hercules. Zeus didn't know what was going on. He didn't know who he just demolished and why the Avengers were reacting the way they did. He was still in a rage but also in the process of figuring it all out. Apparently you missed what I said next. Giving your opponents time to wake up and get back into the fight is holding back. Then you used the wrong scan to support your argument. Battleboard 101: use scans that support your argument. And again, when Pak wrote Hulk actually fighting Zeus, it was no contest. Zeus demolished the Hulk. Do you deny that? 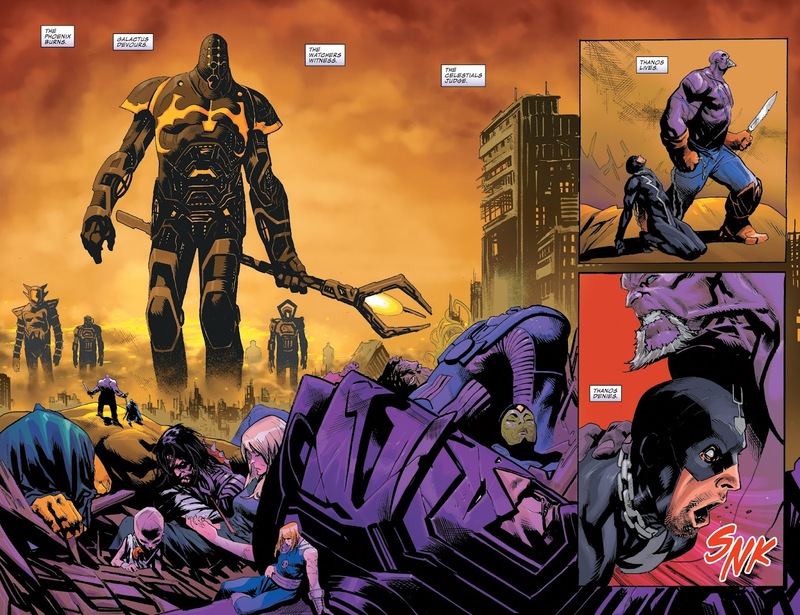 Darkseid surprise attacked the League in the very first seconds of their first encounter. Zeus ko'd all the Avengers with one blast after fighting them at length, so there was no element of surprise there, and the comic clearly stated this was at length because Zeus wanted to keep beating up on the Avengers, not kill them right away. Sparing their lives when he didn't have to is holding back. So are you going to deny what's right there on panel again? She was just wishing out loud. Darkseid had beaten her easily every time. Though it's hilarious you think her statement is the truth and determined his power levels. Considering how it went the last time, I doubt League would be able to beat him. Darkseid saying "with the help of your precious" doesn't means that the league would win. He has defeated the League time and again. Keep trying to lowball Darkseid though, those are certainly entertaining. He left because he had completed his plan. Nothing to gain from fighting League. I'm really not sure if you are able to read or just straight up lying now. Yes, and he was in Warrior madness where he did not held back. 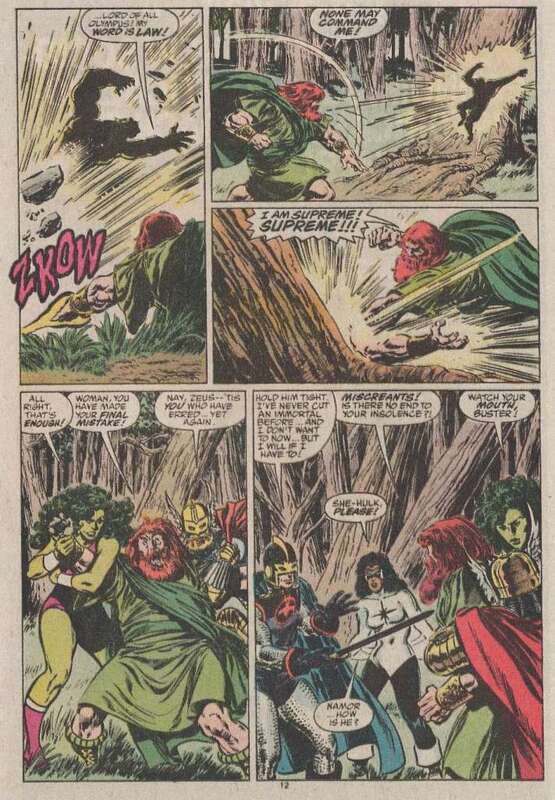 Thor and She Hulk still restrained him like nothing. No, he wasn't in process of figuring it out. He nearly killed Hercules in his rage. You missed a lot of things. Including reading comprehension. Not in that mindset. He was trying to kill Thor at that point. 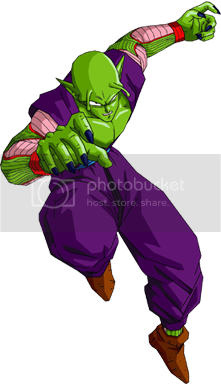 He was also fearful of Hulk as shown by Pak. Ergo he thought Hulk would beat him as you just said Darkseid was in fear of losing to League, right? Those scans are in my support. Darkseid announced himself and then koed the team. It's not a suckerpunch. Zeus koed a weak avengers roster who were tortured and weakened. Zeus was trying to kill Thor. Now you're straight up lying. I've already posted all the scans and cited all the dialogue that refuted all your distorted rationalizations here. I accept your concession about your lying and making things up. 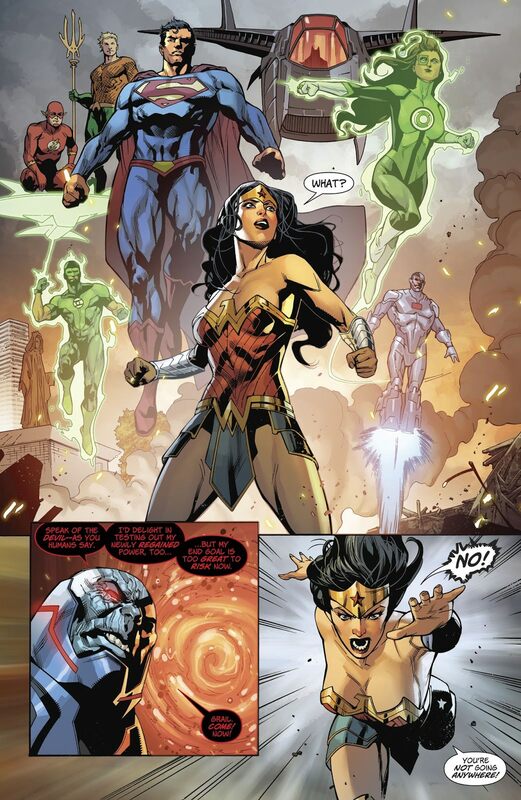 I can't keep up with what's going on here...but it seems to me that Darkseid has a bigger plan that he doesn't want to risk not completing... as opposed to him being worried about the justice league. The two are directly connected - he's worried about the Justice League because they ARE the risk. Yes, that's what's being debated. Because Darkseid wants to test out his power or maybe that's just a bit of bravado. Either way you can read exactly what Darkseid states, "I'd delight in testing out my newly regained power, too, but my end goal is too great to risk now." So what's the risk here? The only risk in this moment is his losing to the Justice League.